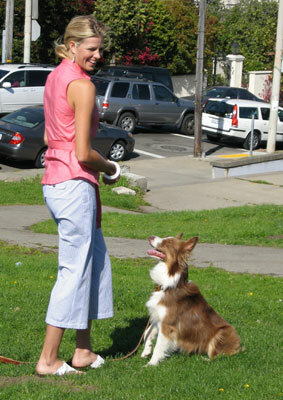 10-9-06 UPDATE: Kiley was chosen for a Docker's brand photo shoot in S.F. recently. Gillian sent us pictures she took of Kiley and the model. Way to go Kiley! Click a thumbnail to see a larger picture! 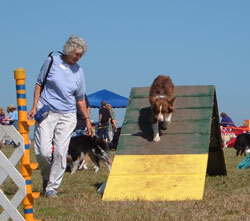 9-4-05 UPDATE: Kiley and Gill made a clean run 9/3 in their very first Agility trial for the US Dog Agility Association. 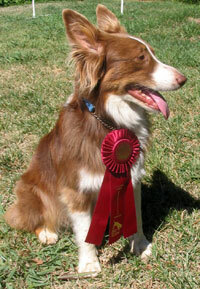 Kiley has earned a qualification and big red ribbon!!! Sunny was the apple of her mom's eye. She went to work with her and snuggled on the couch with her. Sunny had her first litter before she turned one. Tragedy struck about 8 months later when her mom was killed in a car crash. Sunny spent days and nights outside as the husband dealt with his pain and tried to help his children cope. She didn't get to sleep inside, she didn't get to go anywhere. Sunny was suffering too, but no one tended to her. She got pregnant again, and had another litter of pups. Then she started acting out. She escaped from the yard. She squeezed under barbed wire and slashed her side so badly that it required almost 20 stitches. That's when we got the call. Her owner asked us to take her right away, so he drove her to us that night. Sunny was a thin, scared mess with her side still shaved from her stitches, her coat was completely blown from her recent litter. She was jumpy and wouldn't relax. We had her spayed and she chewed off her E collar, got out of a covered 4 foot high exercise pen and took out her stitches...TWICE! I had never seen such determination. Each time she escaped or chewed off her stitches, she would come to me and give me kisses. Finally, her stitches healed and she was ready to "be a dog". I took her to the river where she ran faster than any dog there and where she always, always came back to me when called. She loved to swim in the river, run up and down the dunes and played with every dog there! She'd fetch a tennis ball in a blink of an eye and drop the ball in your lap and wait for another toss. I waited almost two months for the perfect person to come along for her. 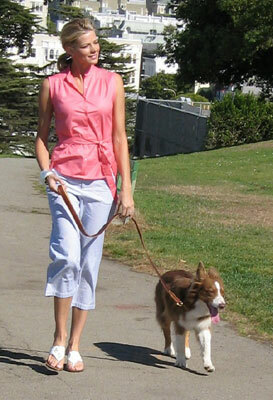 Gillian came to meet Sunny and was struck by her beauty and by her loving nature. 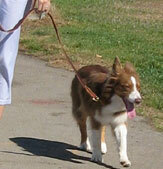 I told Gill that Sunny is an active dog, and she said, "GOOD!" 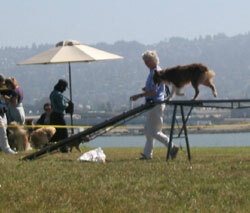 Gill took obedience classes with Sunny, now named Kiley, and has moved on to Agility. 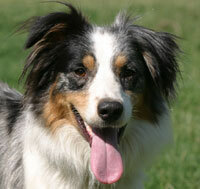 Kiley also goes almost everywhere with Gill, and gets to play Frisbee at the beach often! 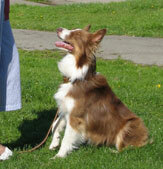 "I just have to tell you what a wonderful dog Kiley has turned out to be. 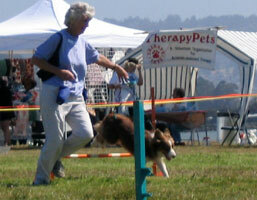 She's the sweetest dog you could ever imagine and she's excelling at agility. Well, we've only had 8 classes so far but she loves it and learns everything so quickly. She has gotten much more friendly with people she doesn't know, maybe because I'm taking her everywhere with me. She sleeps on her bed (which she loves) next to mine and she used to wake me up a bit early but now she waits until she hears me stir, then jumps on my bed and smothers me with kisses. How lucky can I get !!! Thank you so much for choosing me to adopt her. She really is the perfect dog :-)"